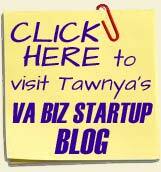 Meet Tawnya Sutherland, Your VA Expert & Virtual MotiVAtor! 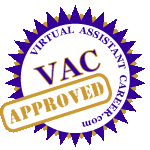 I created the Virtual Assistant Career (VAC) online training curriculum to be that much needed support for Virtual Assistants worldwide. In 1997, when I first became a Virtual Assistant, it was a tough struggle from start-up to success. It was a time-consuming mission to find even the smallest tidbit of information to answer the tiniest of questions I had revolving in my head regarding starting up a Virtual Assistant business. There were few, if any, resourceful books or other social networks to satisfy my quest to learn more on the topic of virtual assistance. The first time I even saw the phrase “Virtual Assistant” was while surfing on the web one day looking for work. I came across a Virtual Assistant’s website by the name of Nina Feldman. From her site I started doing my due diligence to pursue my own VA business. Thanks Nina! You were a catalyst in helping 1000’s of Virtual Assistants get their business up and running quickly and easily through my VAC system! Then along came Elayne Whitfield-Parr and Janice Byer who were another contributor to my success as a VA. It was their organization, Canadian Virtual Assistant Connection (CVAC) that I first joined after a long hard search on the internet for more information on this unknown phrase “virtual assistant.” It was at CVAC that many of my questions were finally answered. This all led me onto the path of eventually leading a worldwide network of Virtual Assistants as well as becoming a major spokesperson in the VA industry, a feat I never would have dreamed possible at that time. Let me briefly tell you a bit about my happy ending story and how I became a Virtual Assistant making that 6 figure income everyone dreams of.I was truly down in the dumps that day when I made the choice to become a Virtual Assistant. I had recently been laid off from my job as VP of a computer service company. I was going through a nasty separation with my husband and was left all alone with three young children to care for 3500 miles away from any family to help support me. The rent was due that week and I had no money in my bank account. I had just got home from taking the city bus to the food bank to get a bag of food for the kids dinner that night. The kids were all grumpy, fighting with each other and being real noisy! I was sitting at the kitchen table feeling sorry for myself about my situation and bawling my eyes out! It hit me like a rock! Right there and then I knew I had to do something about my situation for the sake of my children, I didn’t want them scared in life! And I also knew that I couldn’t keep this up and retain any own sense of happiness in my life either. Mother love was the fuel that I needed to push me into motion again. It was then that I pooled all the resources and skills I had and I decided to be a secretary working from home. I have never looked back! No….it wasn’t easy in 1998 to do this as virtual assistance wasn’t even heard of back then but with a lot of persistance, passion & populace, I figured out the secret to being a successful Virtual Assistant … YES … making a 6 figure income. And I’m here to share it all with you today! It is my hope that the VAC demystifies the questions every Virtual Assistant will have when developing their business. Most of all, it challenges the Virtual Assistant day after day to operate and build a successful Virtual Assistant practice no matter who they are or where they are located. It can be achieved by each and every individual by simply following my VAC System from start to finish. By paying careful attention to the each 30 day module in this online training system, you will have the opportunity to unravel the (not so) complex steps to building a successful Virtual Assistant business. You’ll read about the important business planning stages, setting up your office, developing your service list, marketing for new clients, training and certifications, balancing business and family life, not to mention the marvelous resource tools found within this book. The reader can view this as an online “Virtual Assistant Business Startup Training Center”or strategic business planner. Either way, it will benefit both new and veteran VAs in developing their dreams of obtaining a successful Virtual Assistant business. Had The VAC been around when I was starting out, I know my journey would have been not only considerably shorter but much less stressful. I wish all Virtual Assistants the success in building their new Virtual Assistant business. Trust me, from one VA to another, my VAC system will be a resource that you use on a daily basis…keep it beside you on your desk! A PERSISTENCE to never give up and keep pushing through your business plan no matter what obstacles stand in your way. A PASSION and solid desire to reach the vision you have for you and your business. A POPULACE (networking) with likeminded people in the VA industry (No excuses: Join our free networking forum at VAnetworking.com). 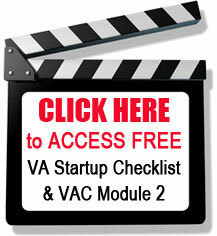 Everything you need to know about starting up a VA practice can be found here in the archives of 10,000’s of posts from other aspiring and successful Virtual Assistants. As founder of VAnetworking.com – the world’s largest social networking site for Virtual Assistants globally –Tawnya Sutherland has become a modern day virtual Den Mother to established and aspiring Virtual Assistants (VAs) wanting to learn, share and grow their business. This personal vision for the growth of the virtual assistant industry has led her to create multiple successful products specifically designed for the virtual professional. One phenomenal success is the internationally acclaimed Virtual Assistant Career (VAC) Startup System , a comprehensive toolkit designed to help aspiring entrepreneurs build a viable virtual assistance business in just 30 days. Having started her business journey over ten years ago as a divorced mother of three, Sutherland recognizes the need for community and resources that simply weren’t to be found before and she has made up her mind that others following in her footsteps would have an easier pathway to navigate. Tawnya knows firsthand the plight of being a single mother with young children that relocates her over 3500 miles across country from her family home far from family help and support. She’s experienced the high cost of daycare making it nearly impossible to work and afford all a family needs. She’s saw that disappointed look in her children’s eyes during special holidays which didn’t turn out as they had dreamed. It was her desperation to find a way to put food on the table for three hungry tummies plus herself that led Sutherland to start a search to enable herself to work from home. With sheer determination, Sutherland took stock of her skills, saw the way the Internet was evolving, and launched Mediamage Business Solutions. Sutherland’s prediction on what would happen online was correct making this a decision that allowed her to earn enough money to stay home and raise her family in the way they were accustomed to before the dissolution of her marriage. Although not an overnight success, she had taken the first step in the right direction. This journey had a happy ending. It made Tawnya passionate about empowering others to launch thriving home-operated businesses in their chosen niche. Her newest venture is VAnetworking’s increasingly popular VAinsider Club where VAs access top-notch advice and support personally given by Sutherland as well as having access to her exclusive worldwide network of business experts. VAinsiders have the added bonus of getting exclusive access to all RFP’s (request for proposals) brought to VAnetworking by qualified clients. VAinsiders, with hundreds of members to date, is the fastest growing club of its kind for virtual professionals looking to put their business in-the-know and on the fast track to success. Sutherland’s decision to launch VAnetworking.com was shaped on the experiences of her professional background as a legal secretary, entrepreneur of two businesses, University graduate, and being a computer company vice president. Today Sutherland, a Certified Internet Marketing Business Strategist, is acknowledged as a well-known and much sought after speaker in the marketing and VA industry. Tawnya thrives in helping business professionals turn clicks into cash and guiding those with dreams of becoming a virtual professional along a now established pathway that many are successfully following. If you’re searching for an Expert in virtual assistance than look no further than Tawnya Sutherland. With over 25,000+ registered members (and growing) at her Virtual Assistant Social Network you, too, can come, learn, share and grow alongside Tawnya.